MEDICAL COSTS SINCE JULY 2013: $274.10 PLEASE CONSIDER MAKING A DONATION! Smiles, aka AK Black Slammer, is a 10-year-old black female with a large white blaze, white nose, and four white feet. 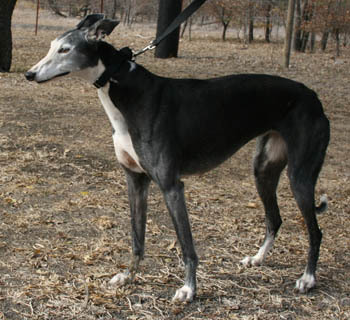 She was born October 12, 2003 to sire Oshkosh Slammer and dam TKM Jetson Mol. Smiles has no races to her credit. This spry, friendly girl is looking forward to a successful search for her forever home! Smiles should not live with cats. Smiles has been diagnosed with osteosarcoma in her left rear leg by Dr. Jeff Ellis of VCA Preston Park Animal Hospital. She is being kept comfortable with pain medications in her loving foster home for as long as possible. The special medical treatment cost needed by Smiles is why the Miss Mesa Fund was established. If you would like to help with Smiles's care, please take a moment to make a donation to the fund. 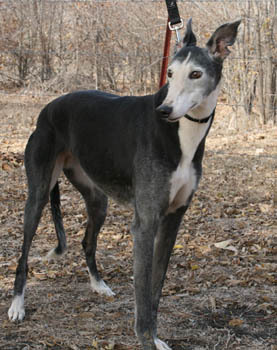 You can use a credit card, check or PayPal by making the donation through the GALT GreytStore. You can also write a check (Greyhound Adoption League of Texas, 3400 Carlisle St, #310, Dallas, TX 75204) and note Miss Mesa Fund/Smiles on your check. 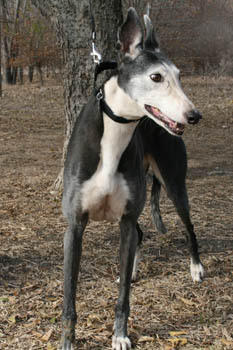 You WILL and CAN make a difference in Smiles's life and the lives of other greyhounds in need of special medical care. Your help and support will make a difference... one greyhound at a time.